Helen Black is an accomplished soprano and has been performing as a soloist at venues across Northern Ireland for many years including Mount Stewart and the Temple of the Winds, Castle Coole, The Mussenden and Galgorm Manor. 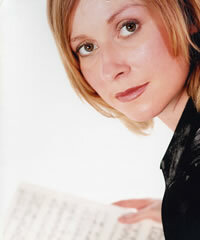 A classically trained mezzo, her repertoire extends from sacred works to theatre and light opera. It also includes traditional airs and contemporary music in a variety of languages. Living and working now in Co. Antrim she is a member of the acclaimed ensemble Capella Caeciliana and is continuing her studies. A CD sample is available on request.